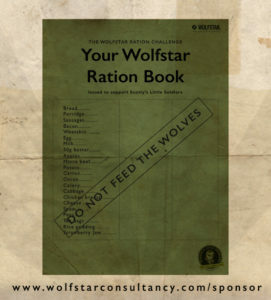 Never ones to shy away from a challenge, from 5th-9th November the Wolfstar team will be undertaking a challenge that we intend to respond to with fortitude, resolve and a stiff upper lip! To support Scotty’s Little Soldiers, a charity for bereaved Armed Forces children, the whole pack will be living on rations for five (long) days. Inspired by wartime spirit, solidarity and the rationing faced by those on the home front during World War II, we will attempt to live off a pack of basic supplies. Challenges come in all shapes and sizes but, as a self-confessed bunch of foodies, this one is definitely going to hit us right where it hurts. If you could spare a few pounds to help ease the pain, strengthen our resolve and build team morale, we’d love for you to sponsor our challenge to help us raise as much as we possibly can for this incredible charity. In return for your donation we promise to do our very best to tackle the challenge with a stoical endurance, a smidging of humour and the roar of Great British lion… or is that just our stomach? Visit our Just Giving page to sponsor us.